Drummers are so underrated that it’s not even fair. Everyone recognizes the lead singer or the lead guitarist but very few people take their time to notice the drummer. This happens a lot, especially in pop music. Being a drummer carries immense responsibility – it’s the drum that dictates the rhythm. It takes years of practice to develop all that muscle memory and groove memory. But of course, everyone has to start somewhere. Don’t worry, it’s never too late to pick up an instrument, not even drums. 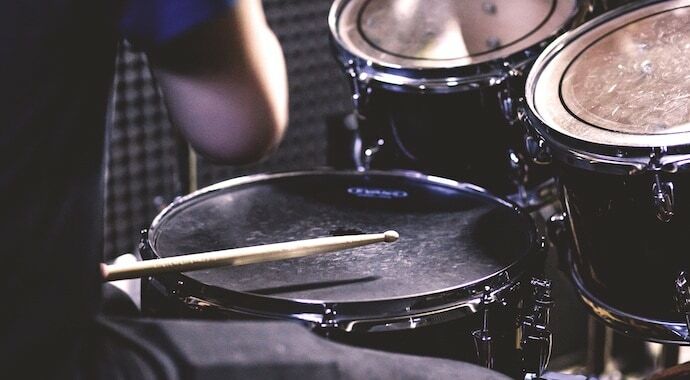 There’s no right or wrong music genre to begin your drumming experience with. Here are my picks for the best beginner drum sets regardless of style, age, and experience. Should You Always Trust the Brand? Should You Add Value to Your Beginner Set as You Progress? We’ll start things off with the Pearl Roadshow. 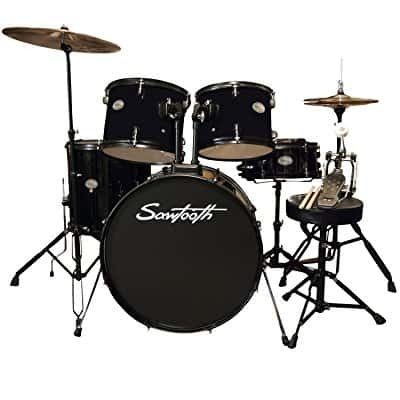 This is a 5-piece starter drum kit of impressive sound quality and durability. As expected of a manufacturer like Pearl, you get only the best in hardware with dual-reinforced and double-braced legs. Stability is important when you’re a beginner, as it can give you a big confidence boost. The pieces are a bit larger than those found on most starter kits. The bass drum is 22”x16” and the snare is 14”x6.5”. They may not be the best for kids but the sound quality is there. There are also three toms included as well as a hi-hat and cymbal on stands. In terms of learning beats and rhythms, there’s nothing you can’t learn on the Roadshow RS525WFC drum set. Due to the overall good quality of both the materials and the sound, the big advantage of the RS535WFC kit is that you can also use it for gigs and rehearsals. 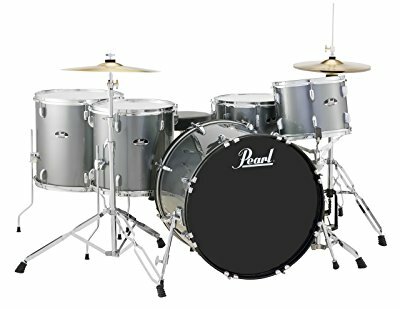 Not many beginner drum sets allow you this opportunity, so this is where Pearl adds great value for the money. There’s nothing wrong with learning to play drums on a professional drum kit. There’s also nothing wrong with getting a junior drum set for kids. The young ones will have an easier time picking up correct habits and muscle memory as the smaller kit components are easier to reach. 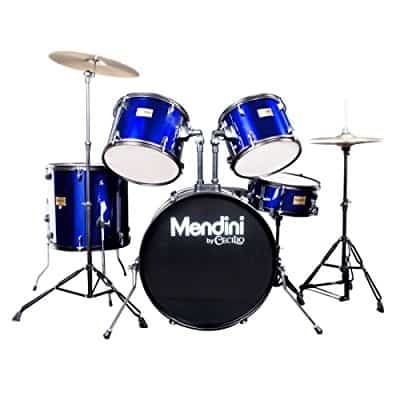 Mendini usually does a great job of creating starter drum kits with decent sound quality. 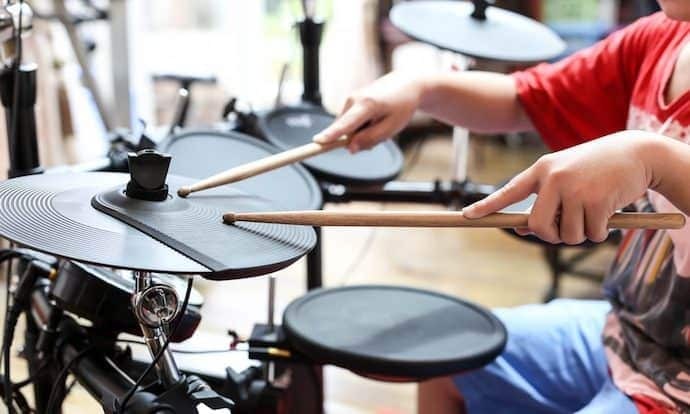 Their Junior Drum set is actually a 5-piece set, which means there’s no limit to what your kid could learn in terms of music theory and grooves. Because of the size of the drum kit, it’s not suited for anyone over 5 feet tall. It’s also probably best if kids under the age of 3 don’t use it since it does have plenty of small parts that may present choking hazards. Unlike the Pearl starter drum kit, Mendini’s Junior Drum set is not stage ready. The sound quality just isn’t there for more than rehearsals and practice. It’s not loud enough or clear enough to make that happen. That being said, here’s what the 5-piece set contains: bass drum, snare drum, three toms, hi-hat, crash cymbal, adjustable seat, pedal, drumsticks, and an instruction manual for the installation. It’s worth mentioning that the cymbals and the front toms come with a mounting system. This helps give the set more stability than most starter kits which favor stands. The durability is a bit questionable as the manufacturer only offers a 1-year warranty. Don’t be scared of an adult set. As I’ve said, you can start learning to play the drums at just about any age. It’s a matter of coordination and will. The conditioning develops along the way. 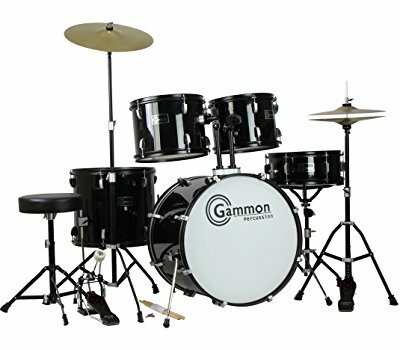 This Gammon adult drum kit is also a starter set. It has a floor tom, two mounted toms, bass drum, snare, hi-hat, and a crash cymbal. Only the two front toms are mounted, everything else is either on the floor or on a stand. So why does this qualify as a starter drum kit? Well, despite its regular size the sound quality just isn’t there for recording or live performances. The quality of the wood is also average, presumably to reduce the price. It’s a starter drum kit because you won’t feel sorry if you break something or if you scratch up the wood. At the same time, the standard size allows adults to start learning on a more suitable platform. The muscle memory can form quicker as everything can be adjusted to be within optimum reach. The sticks are nothing special so you could swap those out as you progress. Obviously, different weight types are better suited for certain musical genres. But, that may not always be the case. It seems that self-taught drummers don’t always follow the norm when it comes to picking equipment. Some say that jazz may not be the easiest genre to start with. While there is some truth to that, not all beginner drummers start on equal footing. Some people are just better musicians who only have to put in a nominal amount of work to pick up playing drums. The Pearl Export-series EXX725S is a very good starter drum kit if you’re into jazz and fusion. The shell quality on the EXX725S does a great job of generating low-end sounds with extended sustain. Although a bit difficult to install, the three-way mounting system will teach you everything you need to know to set up your kit later on. As a professional drummer, knowing the beats and the grooves is not enough. You should be able to assemble your own kit on stage and make adjustments to better suit your playing style. The pedal is of high quality for a starter kit. It’s smooth and offers little resistance. It’s also very durable which means you can expect to play with it for years to come, long after your novice days are over. Make no mistake, there are plenty of students that have never touched a drum kit before. That’s not always helpful as college-level classes demand a certain amount of steady progress. This means that the sessions are usually longer and more intense and the knowledge must be absorbed faster. The reason this starter drum set is best suited for students is the superior durability. This is made to withstand a pounding on a daily basis without cracking the cymbals every week from intense activity or poor-aimed hits. The set lets you play a variety of genres as it is a 5-piece set with three toms, a hi-hat, and a crash ride. They’re all on stands except the two front toms which are on a mounted system for better stability. All the tools needed for assembly and adjustments are included. You’ll also have everything you need to learn how to tend to your drum kit, not just how to play on it. 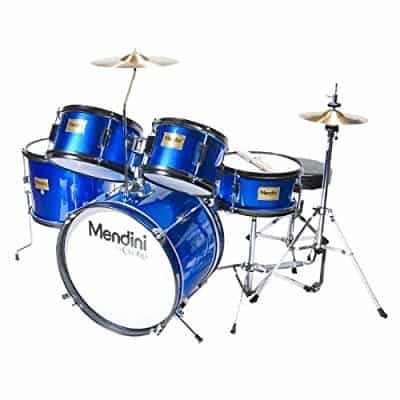 I know it says adult but this Mendini starter drum kit is better suited for teens than adults. The 5-piece kit is a bit better in quality than the junior set previously mentioned. The durability is considerably higher as the drums can endure harder hits. The sound quality is above average but nothing near stage-viable. Because of this, it’s not really a good adult drum set but it’d be great for teen practice and teen garage bands. The drum sticks are surprisingly good, as is the drum stool. The stool is adjustable and has quality padding. The bass drum pedal uses chain drive but it lacks a certain sensitivity that fast tempo genres such as progressive and metal call for. This beginner drum kit is well-suited for kids in the beginner to intermediate skill range. 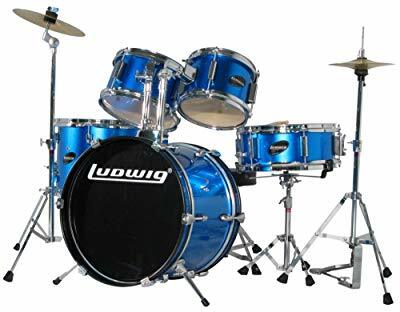 But the kicker is that not only is the Ludwig Junior a good drum kit to practice on, it also sounds pretty good as well as looks amazing for live gigs such as talent shows, school band performances, etc. This drum kit is available in three colors, blue, black, and wine red. The finish on all the wooden components is reflective yet very stylish and makes the kit look like a professional setup. The black and red wine models, in particular, look stage-ready any day of the week. 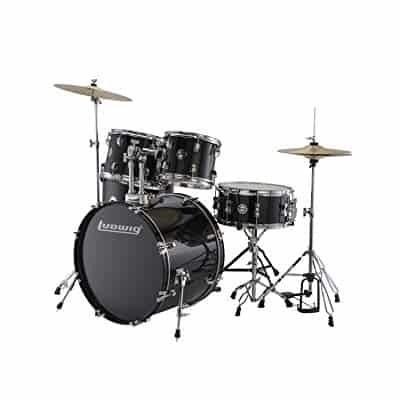 This is a 5-piece drum set which is one of the reasons why it makes a decent choice for kids that want to showcase their skills in a live setting. The 5 pieces are bass drum, snare, floor tom, and two high toms, complete with a pedal, a hi-hat, and a cymbal. This should allow any aspiring young drummers to play a good variety of styles up to hard rock and heavy metal. However, the lack of extra cymbal, raid, and double-pedal makes it less feasible as a drum kit for metal genres. Although this is a pint-sized drum kit, you shouldn’t underestimate the build quality. The drum hardware is all steel and features traditional mounts which allow for easy kit configuration and assembly. The shells are made of wood which makes the kit all the more durable over time and also sound a lot better. Unfortunately the same can’t really be said for the bass drum. Regardless of the build quality, the sound seems a bit too punchy at times. You could try adjusting the tightness but high-level adjustments like this aren’t really part of the design plan. The cymbals are not high-end but considering the limited amount of power a kid can hit them with they’re unlikely to break for a long time. What’s also interesting is the fact that you can tune the heads so you’ll be able to squeeze out even more sound clarity than with the default setup. Visually the Ddrum D120B D Series beginner drum set looks quite alright. Whether you pick the black model or the crimson, the quality of the finish is more than respectable and may even pass as a stage-ready drum kit, of course just visually speaking. There’s one minor aspect that may be considered a drawback and that’s the way the hoops look. They look as if they’re made of plastic, even though the drum kit has an all-steel hardware set. This may be the only thing that cheapens a bit the overall look of the kit. 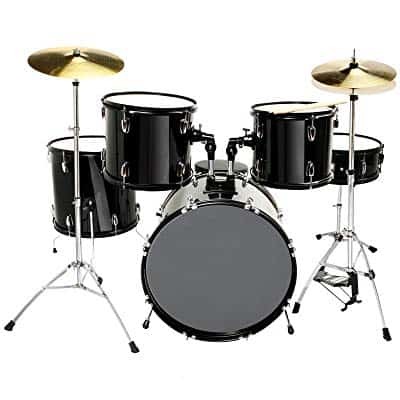 In terms of components, the D120B drum kit has everything a teen or an adult beginner needs. The drum set has a 20”x16” kick drum, a 14” snare, a 12” floor tom, and two high toms (12”x9” and 14”x14”). As far as tone and power, you can get quite a lot from the D120B even though it’s a bit scaled down from a standard full-sized adult drum kit. Still, this drum set isn’t designed for live gigs so as long as you need something to practice on at home or something to use in a jam session in the studio or garage, you won’t be drowned out by the other instruments. The cymbals, on the other hand, are not that high-end in terms of sound. Although they’re fairly durable, neither the 14” hi-hat nor the 16” crash has a distinctive sound, or a lot of power for that matter. But if you’re looking to hold the rhythm and learn the basics of 12-bar blues, the soft sound may actually be a blessing in disguise. Another minor inconvenience may be the drum throne. It’s also downscaled to match the rest of the kit, which means that it leaves out little adjustment options for taller drummers. However, a cheap replacement can always be purchased for more comfortable practice sessions. The Accent-series of drum kits from Ludwig includes some of the most popular starter sets sold worldwide. There’s a simple reason behind this. These drum kits offer a good balance between price, hardware quality, and sound. They come with the components necessary to build a solid foundation and have room leftover for progress with minimal investment afterwards. The LC175 offers a nice 5-piece setup complete with a high-hat, crash, drum throne, drum sticks, and pedal. The floor tom has an impressive size of 16”x16” which should allow you to get quite a powerful output even if it has a bit of an echo. The bass drum is 16”x22” which is a proper size for teens and adults alike. The build quality is great and so is the exterior finish. However, in order to get a deeper and clearer tone you may want to use the pillow or blanket method. That should take care of any extra dryness and punch from your kicks. The two high toms sound pretty ok out of the box, so there’s no real need to tune them. The sound is full and the quality of the heads is surprisingly superior to what you see in this price range. But I guess that’s why it pays to go with a top brand most of the times, even for starter drum kits. The snare drum that comes with the LC175 is neither here nor there. You can make some adjustments to it to fit your play style, but don’t think that you can achieve too much by doing so. The good news is that it doesn’t really have that bucket sound that most cheap drum kit snares have, and it’s quite loud too. If you want to exercise snare accents, this is a good set to start on. The contrast between the cymbals is not amazing. While the hi-hat offers decent clarity and enough power, the 16” crash just doesn’t seem to have enough sustain. 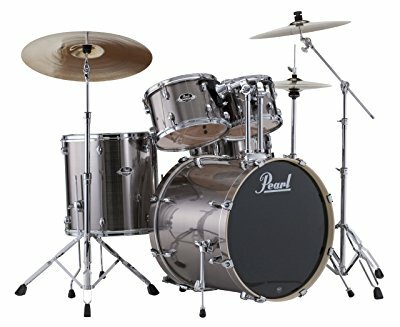 This may very well limit the drum kit’s use for more intermediate players that want to learn more techniques and tackle more musical genres. As you can already tell, the LC175 is not designed for a particular style of music. Luckily, the quality and size of the drums allow you to exercise accents and different grooves without having to make any considerable adjustments to the default configuration. Other than maybe putting a pillow in your bass drum of course. If there’s one thing that truly makes this Lagrima beginner drum set for adults stand out, it is the overall quality of the build. Everything from the steel and PVC hardware to the drum skin is top-notch, which says a lot about this lesser known brand. The 5-piece drum kit comes complete with a hi-hat, pedal, crash, throne, and sticks which are surprisingly light and easy to learn with. A high-gloss finish is applied to all the drum shells and gives the drum set a stage-ready look. But, that’s not enough to look for in a drum kit if you want to make a good impression live, so let’s talk sound for a bit. Due to the extra elasticity from the double-layer oil skins, these drums can play loud, make no mistake about that. The 22.5” bass drum has a rich sound and surprisingly little punch even without any adjustments. You don’t see that every day in a starter kit. The floor tom is 16” while the high toms are 14” each. This allows you to create interesting and distinctive grooves where your accents during fills don’t get lost in the background. To further enrich the sound, you get the 14”x5.5” snare which has a powerful snappy sound that’s just perfect for exercising solos, fills, and rapid transitions. However, while the quality of the sound is superior to beginner and some intermediate drum kits, don’t expect to wow a large venue even with the best microphones on the market attached to your gear. The sound is clear which is very important if you’re serious about practicing different techniques. Equally important is the superior durability of the drum kit that extends to the cymbals as well. 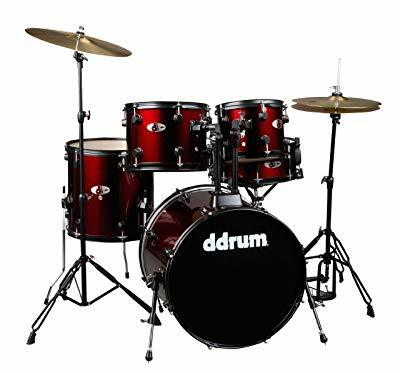 This drum set is also reasonably priced considering its durability, sound, and finish, which is why it’s a personal favorite of mine for beginner drummers that have a late start. There are many pieces to drum sets and it’s not easy for a beginner to know which ones are important and worth the money. Here’s what you need to know about the starter pieces. Bass drum - the biggest drum that’s usually at the center of any kit. This is how you get your downbeats. Snare drum - the sharp sound created by the snare establishes the rhythm of any song. Hi-Hat - the hi-hat accompanies the snare. Both the hi-hat and the bass drum are played with pedals so they both make for good practice. Everything else you get on a starter kit is pure luxury. In terms of initial investments, you don’t really need toms or extra cymbals. That is, if you don’t want to overwhelm yourself with knowledge at the start. For the inexperienced user, it’s tempting to believe that an adult drum kit is better than a downscaled version even if both are designed for beginners. The only time when an adult set is the best option is when you know you’re serious about drumming and you know you’ll quickly grow into it. Sure, adult drum kits tend to have a louder sound, but that doesn’t always make them a better choice. I guess another advantage of having an adult-sized drum set is that it’s easier to find quality replacements for your cymbals, as the stock ones will sooner or later crack. It’s also easier to replace the drum heads with higher-quality ones while keeping the same shells, although this isn’t always advised. Nothing beats the sound of an expertly made traditional drum kit. However, not everyone has the luxury of having a space to practice in. This is where the electronic drum kit comes in handy. If you don’t want to bother your parents, siblings, neighbors, and what have you, getting an electronic kit might be the only way of learning to play the drums. They make virtually no noise and while they’re mostly used for recording purposes, they can make your dream come true in an apartment setting too. Unfortunately, electronic drum sets can get expensive. They only make sense as a beginner option if you’re sure about your commitment to become a drummer. 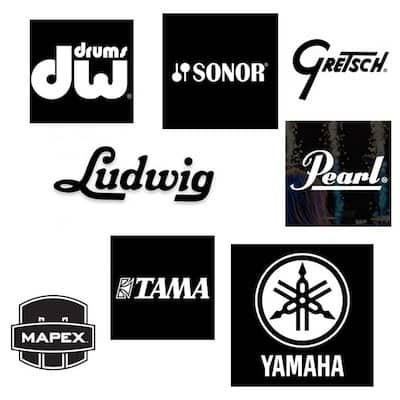 There are a couple of well-established brands that cater mostly to drummers in their learning phase. That’s not to say that popular manufacturers don’t also come out with decent starter drum kits for the masses. The downside of most of these pro starter kits is often the price. You would expect that top drum kit manufacturers would offer higher quality drum sets with better materials, superior sound, and durability. Sadly that’s not often the case. Brands that focus on creating learning equipment often deliver superior products. So, don’t be fooled by logos if you’re buying a starter set. You may be on your way to overpaying. Last but not least, think about the genre you want to play. Skills and preferences develop and change over time but the initial choice is very important. 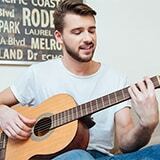 You may not like learning rhythms for rock on a 5 or 6-piece set made for jazz or progressive. The genres also dictate the difficulty of the learning curve. It is sometimes best not to overcomplicate things by having too many drum components to hit, i.e. multiple toms and multiple cymbals or even a double bass pedal. No one says it’s mandatory to start with basic setups but it sure helps in some situations. 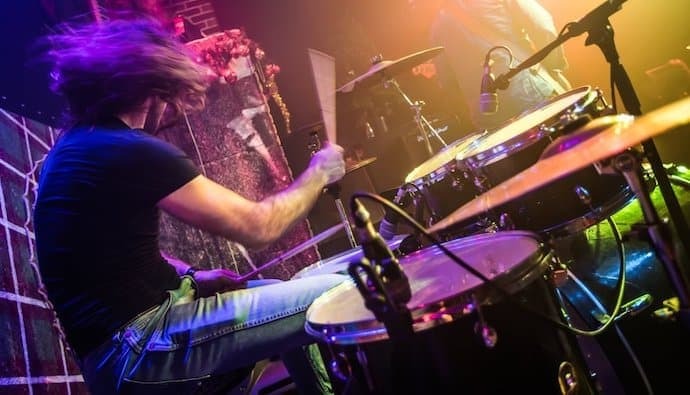 Depending on what genre you want to play at the beginning, you’ll need a particular type of drum setup and sound to get the ball rolling in your favor. As I've already mentioned, it’s not always a good idea to start buying high-end components for your beginner adult drum kit just because you’ve gotten a lot better. If that really was a good idea, then we would see a lot of professional musicians playing on cheap shells and hardware and adding professional skins, cymbals, and pedals to the mix. Take double bass pedals for example. As sturdy and durable as some beginner drum kits are, most of them can’t handle the abuse of a double bass pedal. It doesn’t even matter if it’s a single-chain or a double-chain model. Ultra rapid kicks that pack even more power won’t work without a super stable setup. You also have to take into account the fact that a beginner-grade bass drum doesn’t have the necessary hardware to support a double bass pedal. Pretty much the same thing goes for everything else. The skin is not strong enough to handle the extra power. You can’t just mix and match any drum kit rack with any drum set and hope that all your cymbals and toms are within comfortable reach. 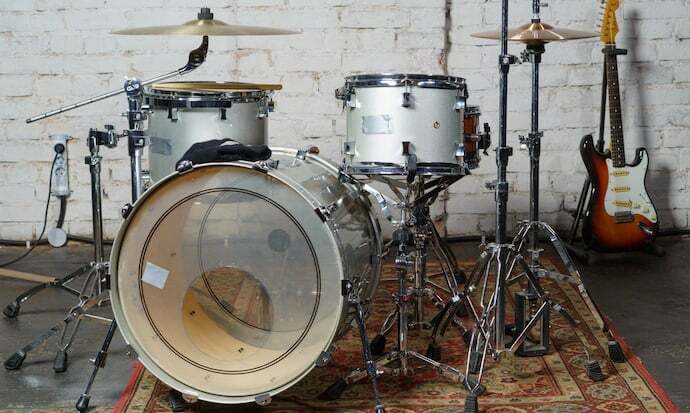 Drum kits designed for beginners don’t always come with detailed assembly instructions. Of course, these days it’s easy to make it a DIY project after watching a YouTube video. 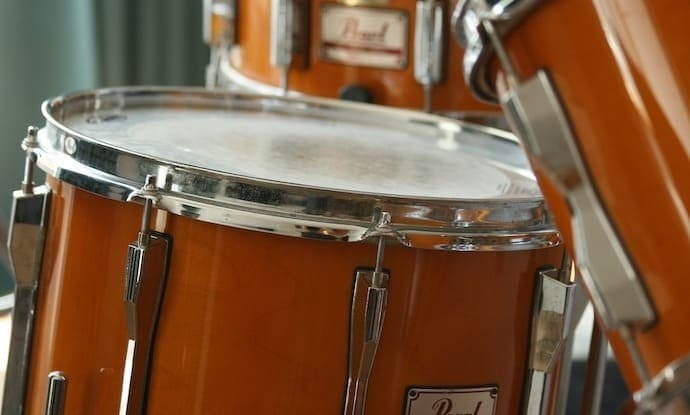 However, unless you’re taking lessons from someone, there are a couple of things about drum maintenance and proper playing that you can’t play by ear or learn from books. Keep in mind that even the highest-quality beginner drum kits have an expiration date. That’s because the cymbals and the skins are usually the first to go. In order to get the most use from your toms, it’s best to put down some tape on the skin and try to keep your hits consistent to that area. This not only helps exercise precision but also allows you to spare the skin for a bit longer. In order to place the tape in the right place, you have to hit the toms in various spots until you find the best tone. Once you got that down, stick a 2-3 inch piece of tape on it and focus on hitting the mark. Taking care of the cymbals is also important. Unless you hit them like you’re trying to break a wall, you shouldn’t have to worry too much. However, you need to take extra care when you’re taking them off and putting them into storage. Dropping them or banging them together can cause them to instantly crack, especially those found in beginner kits. Based on the quality of most starter drum kits, you may be wondering if it’s really worth buying one instead of getting a professional kit. Here’s one way to look at it. Professional drum kits are very expensive. What you see at concerts or in recording studio costs serious dough. 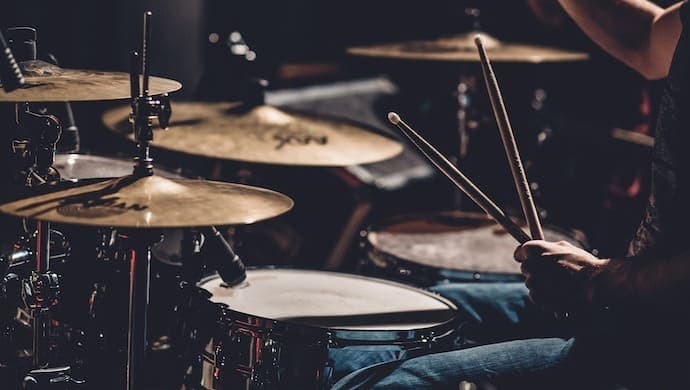 Drumming is not easy to pick up and a lot of beginners might feel overwhelmed and quit even from a basic 3-piece drum kit. The whole point of a starter set is to have something that won’t break the bank while still coming close to professional playing conditions. Once your muscle memory is formed and you’re ready to commit and improve further, only then does it make sense to go the extra mile for professional sound quality.